We love this sleeveless gym hoodie and you will, too. Ideal to fat arm out the car window post workout and also perfect for the cooler mornings for covering up when you just want to get your head down and train. Totally stylish with a fitted hoodie look, it's a slight twist on a classic. We've added a roomy kangaroo pocket (ideal for MP3 player, training diary and pen, gym card, or locker key) and made the hood large enough that you can pull it on and off without getting stuck. The clasic BP slogan tells people exactly what you're about: harder, stronger, longer. 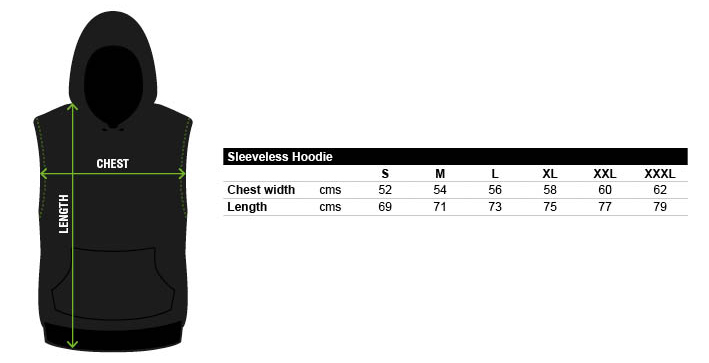 Fits a bit small, so order a size up from your normal size if you wont a bit more of a loose fit. Great to wear while working out, comfortable and looks good, the cut is complimentary. Looks good on, nice snug fit, go up a size if you want a looser fit - nice and light wear for the gym after a workout. Great hoodie fits well and washes great, awesome for the gym when you want something warm but not too thick. The hoodie has a graet fit and for some reason accentuates the arms perfectly. Would and will recommend this to all my lifting and non lifting pals. Great Hoodie, fits really well and the cut is perfect for displaying the hard work being put in. My favorite training top, keeps me warm, whilst giving me the freedom for snatches, cleans and front squats. Perfect for any Olympic lifter.